& Gas Fireplace Technician Today! At Edwards & Mills, Inc., we are proud to have been installing RH Peterson Co. Realfyre® gas logs in Greensboro since 1972. To date, we have performed more than 12,000 gas log installations in the Piedmont Triad area, including High Point, Greensboro, Winston-Salem, and surrounding areas. We furnish and install Peterson gas logs simply because we believe they are the most reliable and best-looking logs on the market today. The company offers a great selection of more than 40 different styles to complement any home's décor, as well as a large variety of gas log accessories (such as ceramic pinecones and acorns) to dress up your gas fireplace. You get the look you desire—from country and traditional fireplaces to contemporary glass fireplaces featuring stone and geo-shapes, which add a dramatic modern flare. Peterson has been in business since 1949, offering a large selection of vented and non-vented gas logs. All Peterson vented ceramic refractory gas logs are warranted for as long as you own them. Give us a call today, and ask to speak with Phil Edwards our primary specialist in gas log installations, services, and repair. Phil has been installing gas logs for 40-plus years, and in most cases, he can you give you an estimate over the phone. The rest of our team are experts at gas log installation, service, and repair, too. All of our gas log installers have more than 12 years of experience installing gas logs, as well as other gas products like gas fire pits, gas grills, gas lamps, and gas ranges. 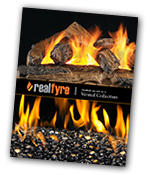 You will find the catalog of RH Peterson Co. Realfyre gas logs below. Please take a look for inspiration; they really are a beautiful addition to any home! If you have a gas log installation problem or you’d like to purchase Peterson® gas logs, our knowledgeable, professional experts are standing by to assist you. Feel free to contact us at any time about these or any of our other plumbing or gas services by phone (336) 299-6309 or by email.